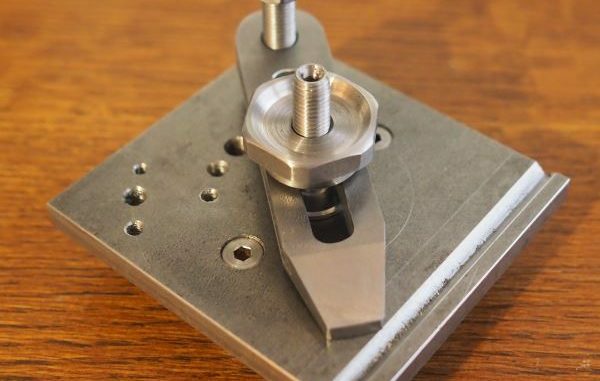 I’ve seen a few of these on different websites, Instagram, Pinterest and I thought I would make one as they look useful for clamping workpieces. 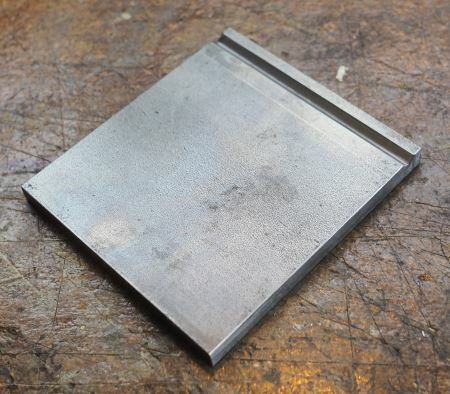 I started with a piece of 1/4″ thick mild steel, 3″ wide and roughly 2.75″ long – an offcut from something. You can see that I’ve used this piece in the past for some blueing trials. The first job was to machine the edges. The Soba vice at it’s maximum opening of 3.01″ – a very tight squeeze. 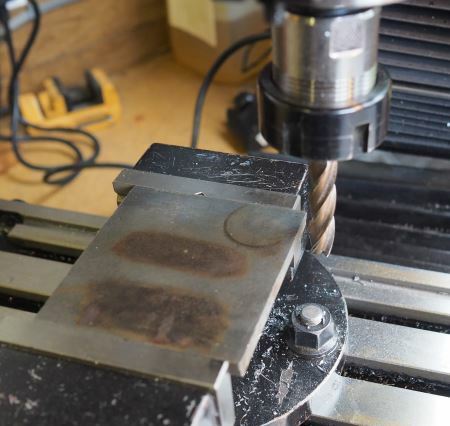 Then using a 10mm end mill to machine each edge in turn. 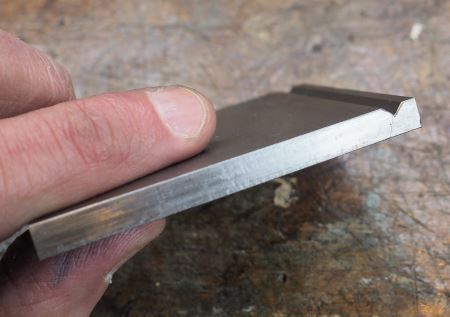 The next task was to put a V shaped groove into the plate close to one edge. 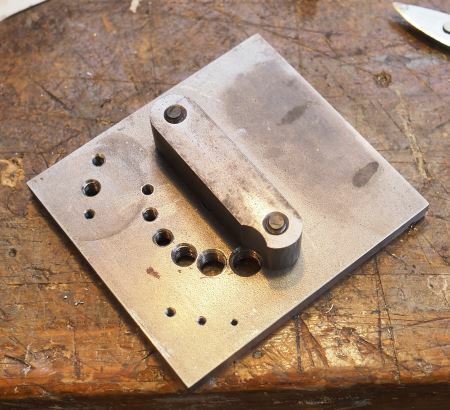 I arranged the plate in the vice at an angle of 45° – the angle was set using a digital gauge. I machined the groove using a slot drill. Not sure this is the correct milling bit to use for this operation, but the result was a clean looking groove as can be seen in the image to the left. 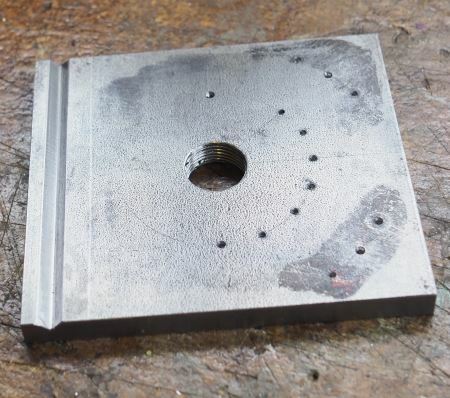 You can see here a lot more marks at two different radii – the thought here was to drill and tap some of my common thread sizes so that I can use the plate to work on bolts and bolt heads. A clamp with a 3mm wide groove down each edge – not sure why I made the groove, but it does look good. 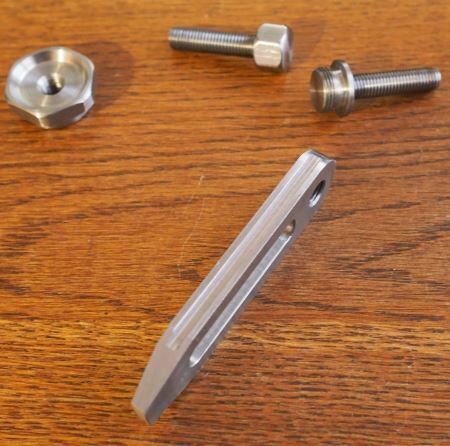 The central bolt is 1/2″x26tpi at one end and 7 x 1 mm on the main stud and 7 x 1 mm for the bolt that works as the support. This next picture puts the plate, clamp and bolts all together in context. The 7 x 1mm thread has a lovely look to it, the proportions are superb – must be an engineer thing. The clamp, plate and stud does look good. The clamping bar might be a tad chunky. Here you can see the plate resting on the workbench, but I also wanted to be able to clamp the plate in a vice. 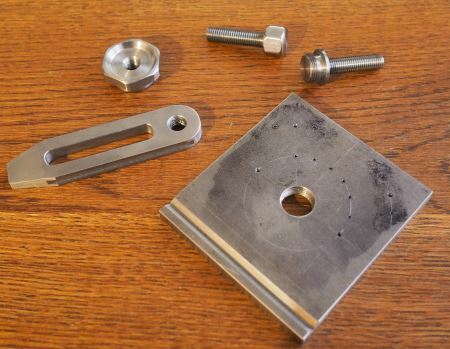 I needed a bar that I could fix under the plate and that could then be clamped in the vice, a piece of 1/2″ square mild steel with rounded ends and that I could then fix with countersunk bolts through the plate would work perfect. 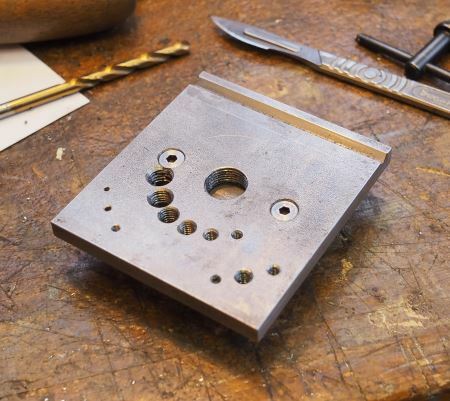 The rounded ends were machined by simply using a pivot point and taking a number of cuts – all at the same height. The bar is rotated around the pivot – in this case a drill bit through the hole in the bar. The sequence shows a number of the angles and cuts, I did have to flip the bar over as it is longer than the vice jaws are high. 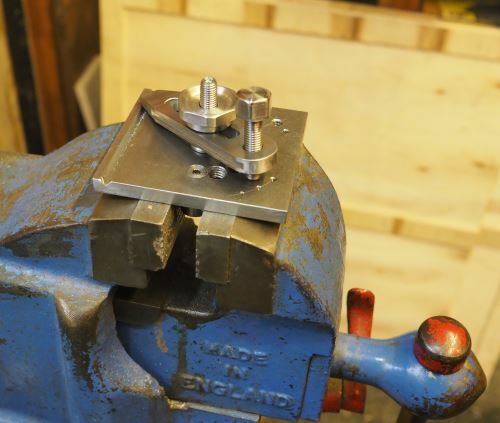 You do have to take care and to stop the machine each time, move the bar a small angle, clamp the bar in the machine vice and take another slice. If the cutter is wide than the material then this is a simple cut and then back again. As I said, be careful, take your time and the smaller the angles the finer the end result. I use a final to create the final round finish. The final image shows the vice bar with the hole having been tapped. The bar in place under the plate. 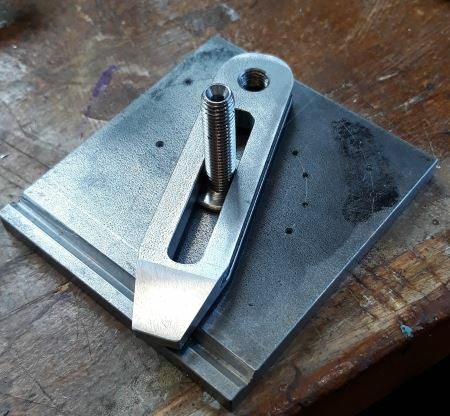 The notch is to create a clearance for the 8mm threaded hole – the whole finger plate and dimensions have evolved as I’ve made this and sometimes I get this wrong. The bar is great for mounting the plate in a vice, but just two bolts means it’s easy to get back to a flat plate for working on the bench. The clamp shown in the engineers vice in my workshop. I must admit that I’m now not sure why I needed the threaded holes and that a clean flat plat would be more useful. The clamp does change and improve the usefulness of the vice as it allows me to now clamp parts in a different orientation and I can now clamp different items. I’ve yet to use this in anger, but it does add to the tools that I have.